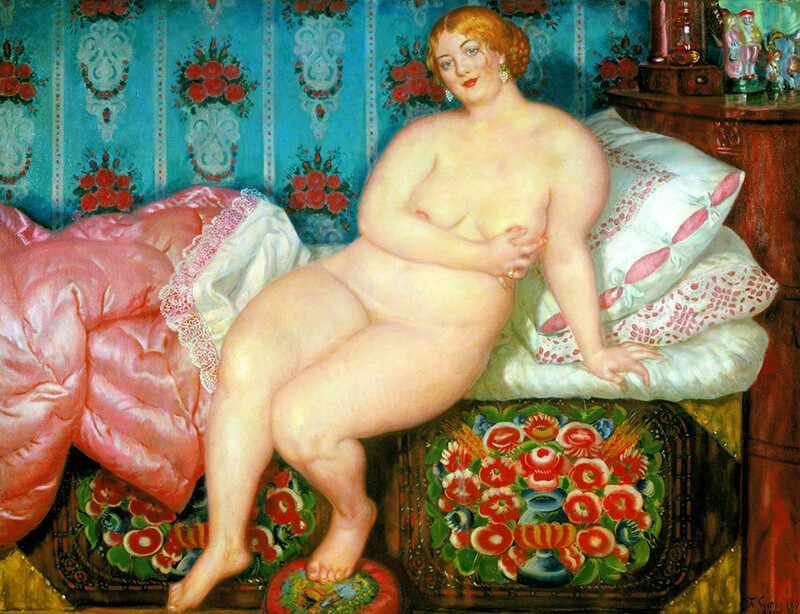 If you happen to see ruddy and pudgy women, folk festivities and a riot of colors, then chances are that you’re looking at a painting by Boris Kustodiev. On the occasion of his 140th birthday, let's look at his most interesting paintings. 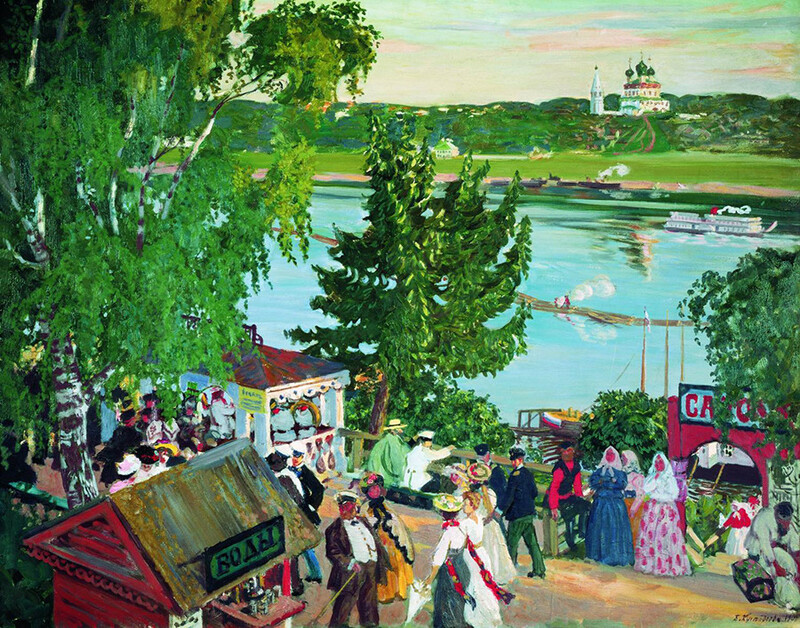 The young Kustodiev, however, suddenly turned to genre painting and moved to the city of Kostroma on the Volga River looking for authentic Russian characters and images. There he found something that later became the main themes in his art: scenes of merchant life, women in colorful dresses and folk life. For some time he even worked at several magazines of political caricature. 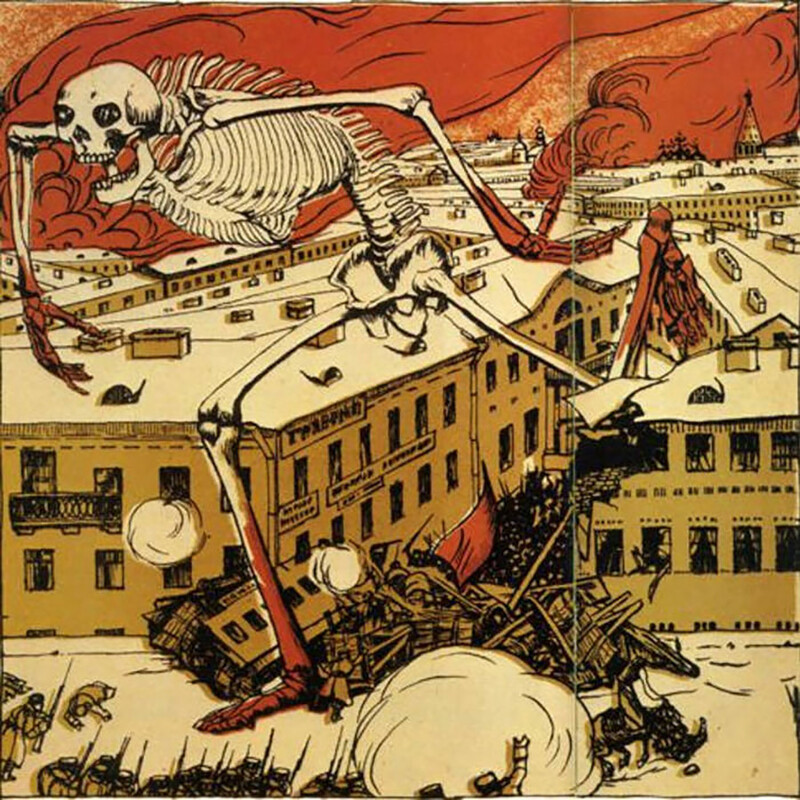 His 1906 drawing, “Zhupel (Bugbear)of Revolution,” shows a giant red skeleton walking across the city and stepping on houses and corpses. 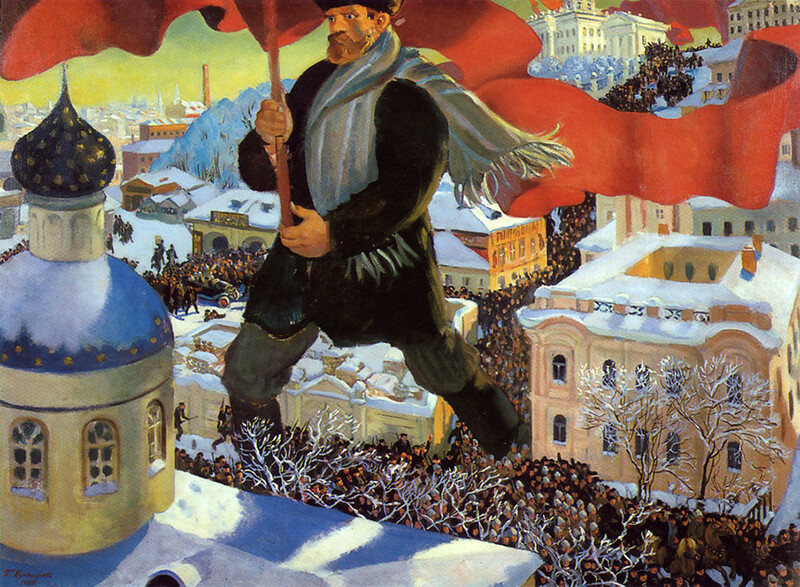 This image reflects Kustodiev’s opinion about Russia’s first revolution. 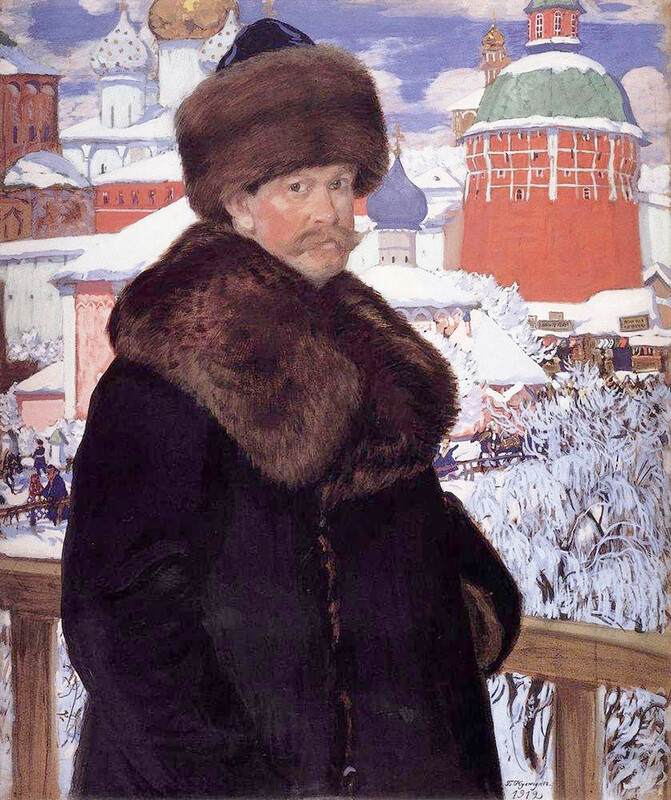 Kustodiev was critically acclaimed and his services were in demand. Once he was even chosen over Valentin Serov and offered the position of portrait teacher at the Moscow School of Painting, Sculpture and Architecture. He turned down the offer, however, because he didn’t want anything to intefere with his painting. 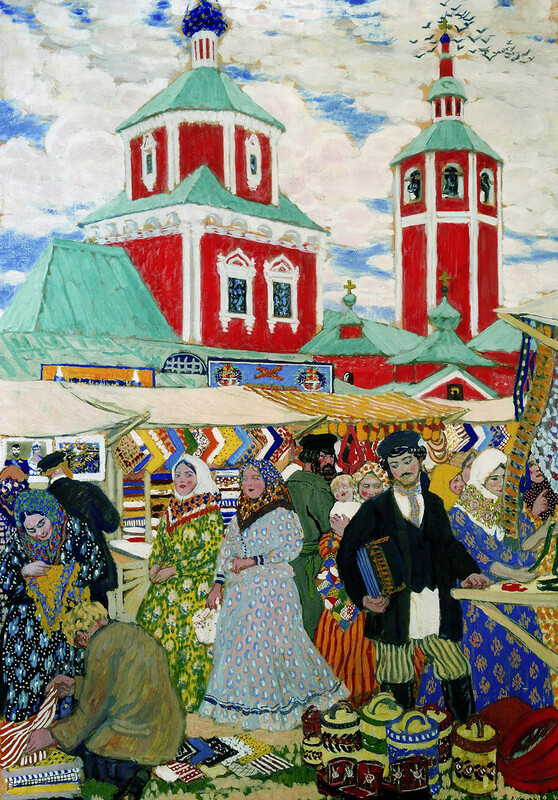 Together with Roerich, Bakst, Benoir, Levitan and many others, Kustodiev was a member of the Mir Iskusstva (World of Art) art movement that’s famous for production of Sergei Diaghilev's Ballets Russes. 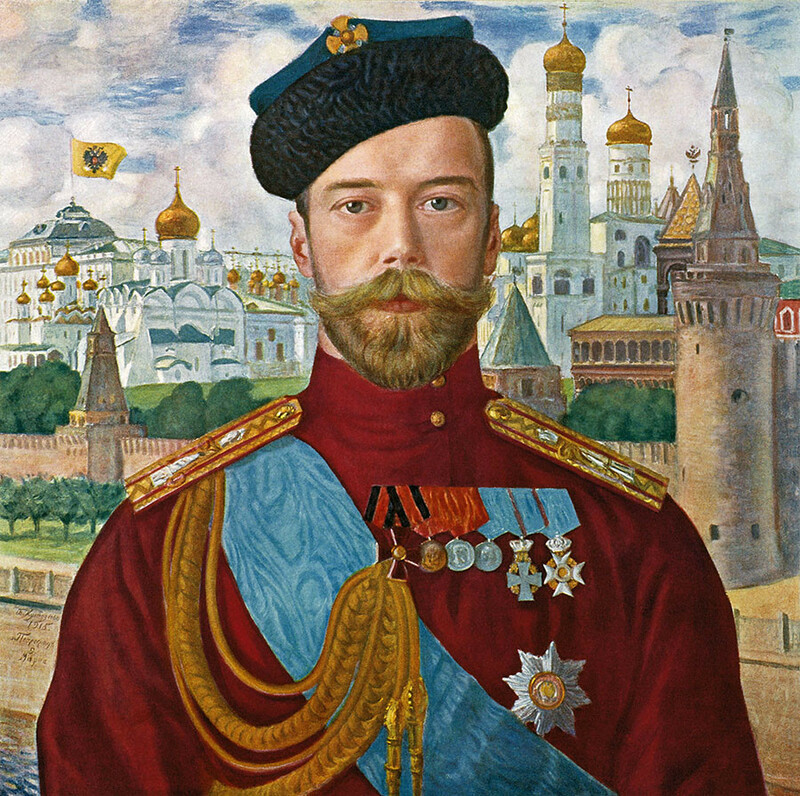 These artists looked to ancient Russian culture for inspiration. Before Mir Iskusstva, all the theaters had standard decorations and costumes for each performance, and changing them depended on the topic. 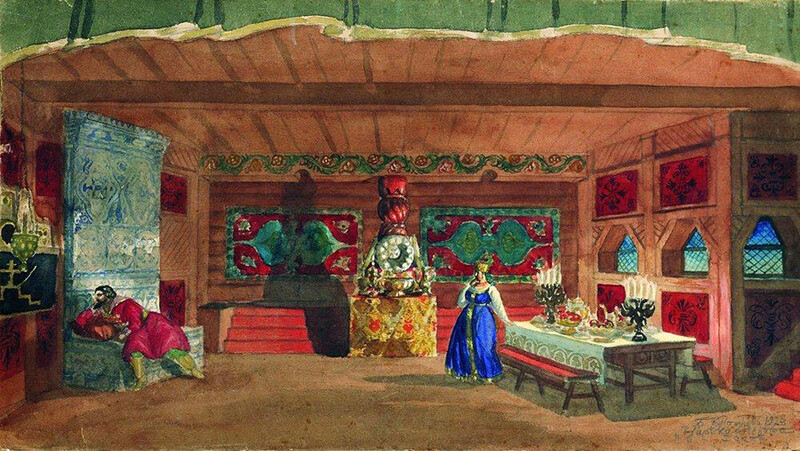 Together with the others in the Mir Iskusstva movement, Kustodiev worked on unique theater design for each performance. He created stage decorations and costume designs for modernist performances such as Rimsky-Korsakov’s operas, The Tsar's Bride and The Snow Maiden, and for several of Alexander Ostrovsky's plays. 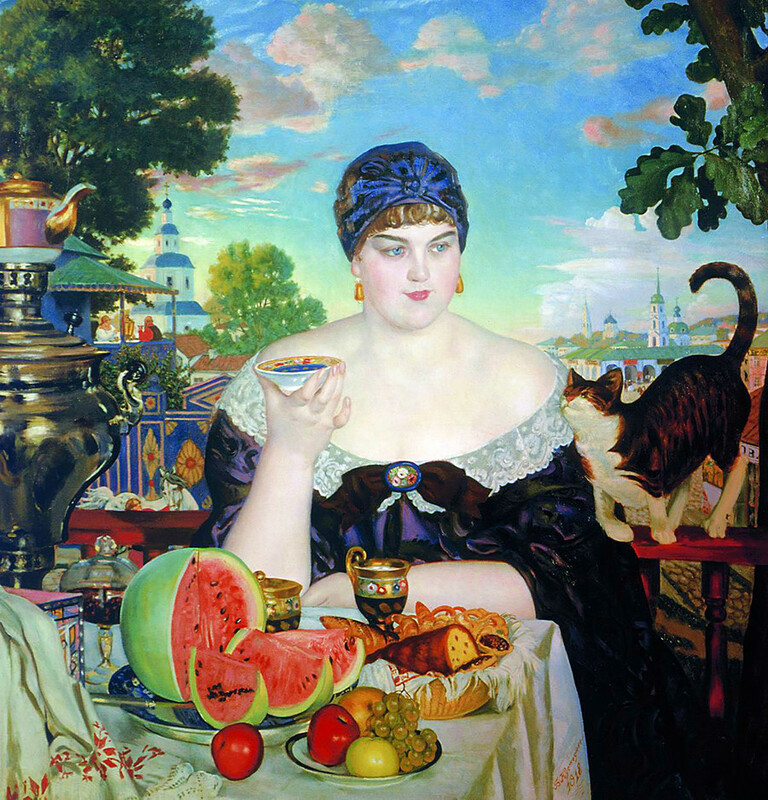 The bright genre of Kustodiev’s art shows provincial Russian life as a fairy tale. Interestingly, his first attempts in this genre were made when drawing portraits, such as that of the famous singer Feodor Chaliapin, and Tsar Nicholas II, as well as self-portraits. Kustodiev’s book illustrations for classical literature are also significant. He worked in graphics and lithography to illustrate stories by Nikolai Gogol, Mikhail Lermontov, Leo Tolstoy, Nikolai Leskov and others. In 1909 the artist began to suffer a tumor in his spinal cord, and despite several surgeries he ended up being confined to a wheelchair for the rest of his life. Still, for those remaining 15 years Kustodiev continued to paint, and his most colorful and inspiring works date to these years. Sitting at home paralyzed, Kustodiev never witnessed the revolutionary events of 1917, and in 1920 he made his famous painting, “Bolshevik.” This was his reaction and interpretation of the Revolution. The image of a massive proletarian leading the people with a red flag is ambiguous, however. While the fledgling Soviet government saw it as an affirmation of their ideology, it seems that there is a strong similarity with the skeleton from Zhupel.